Today is the day for the new Pompadours! We managed to sell clean out of the old Pomps, so we took the opportunity to make some improvements that I know you'll love. Of course! Period accuracy is our primary focus, and with each new development, we try to get closer to how original shoes looked, but without the pinchy, blistery, squeezy, pain of shoes that lacked rather important things like arch support. A few of Pompadour's reference pieces can be found here, here, and here. When you've spent so much time on your gorgeous gown, why pair it with lackluster shoes? 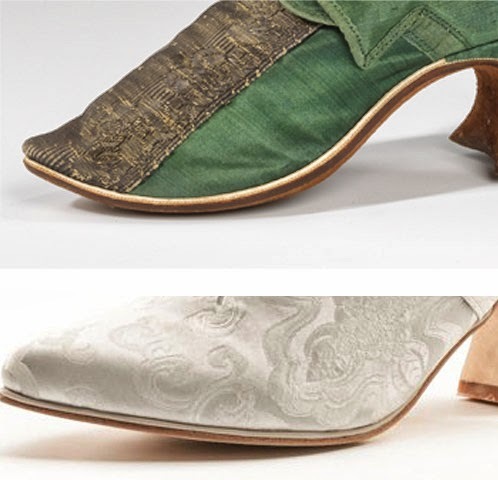 Ladies of the period certainly didn't - middling and upper class ladies' shoes were made of brocade, embroidered silk, painted leather, and laced damask. These shoes were jewels for the feet, which is exactly the point of Pompadours as well. Don't believe me? Here's a Pompadour dyed ORANGE, using International Fabric Shoe Dyes, coming soon to our shop. The brocade pattern takes the dye up strongly, while the background is a softer tone. Orange creamsicle Pompadours? sure, why not!? 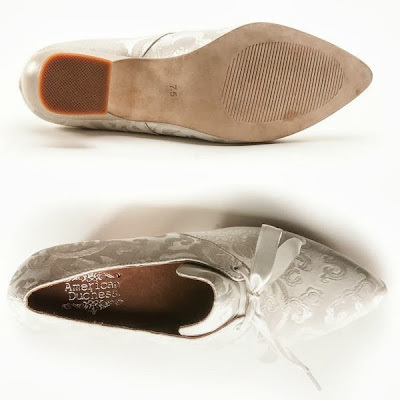 The white rand is a piece of leather "piping" between the upper and sole, found on shoes prior to roughly the 1760s/70s. It is a characteristic trait we felt was important to the historically accurate look of the shoe - plus it's snazzy. 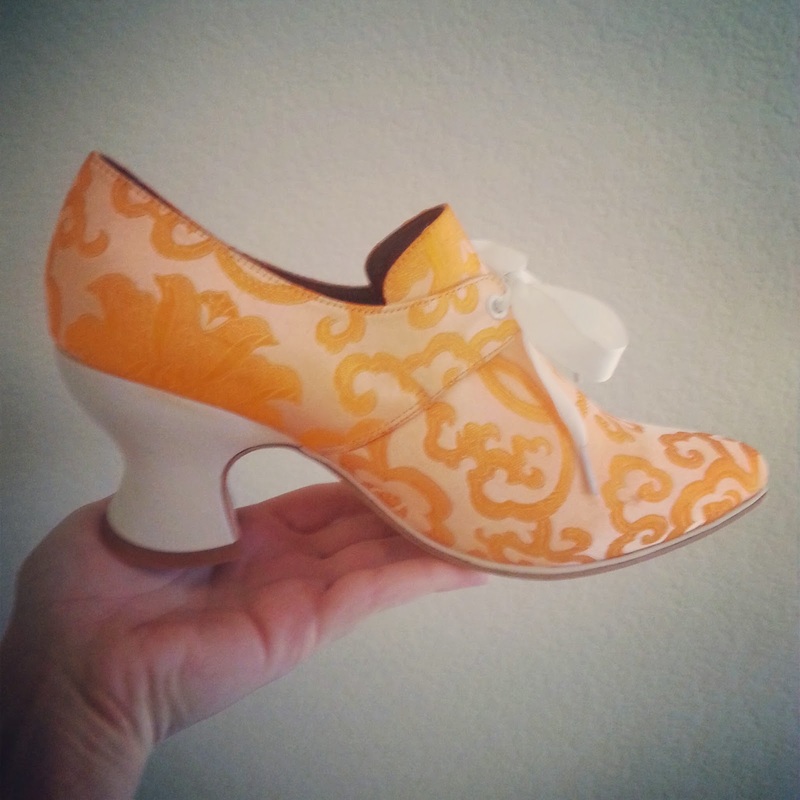 Pompadour's heels were custom made just for us, and can only be found on American Duchess shoes. They are curvaceous and thick, just like original Georgian heels. Pompadours fit better than ever, with more accurate sizing, more ease over the arch, and a slightly-less-crazy-but-no-less-elegant pointed toe. Pompadour's new toe shape is still elegantly pointed, and more comfortable to wear. We've also improved materials - the lining, heel material, rand, and sole are all real leather, which means better comfort and accuracy all around. Pompadours have been sent to production companies all over the world, from Film Afrika in South Africa, to the Metropolitan Opera in New York City. Our particular favorite was the appearance Pompadours made in NBC's "Smash," on the feet of lead actress Megan Hilty. The new Pompadours are now available to pre-order at AmericanDuchess.com . Pompadours are already in production, so size quantities are limited. Delivery is in January - a long time, but well worth the wait, as Pompadours are one of our most in-demand styles. i would love these dyed to a denim blue, i would love to wear these with jeans and a denim frock coat! Beautiful shoes as always, when are the 1860s heels coming? Eagerly awaiting those! Thanks Michelle! 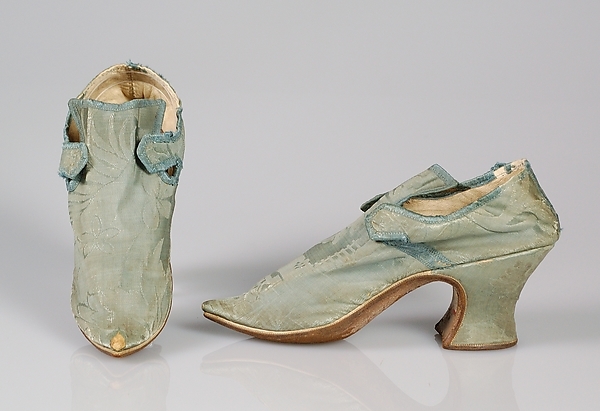 I don't have a clear answer about the 1860s heels. The factory working on the sample was actually hit by a typhoon (no joke), an it has delayed everything. I hope to have some news soon! thought they were cute before but the dyed picture? Wow! and jendem, you were reading my mind! 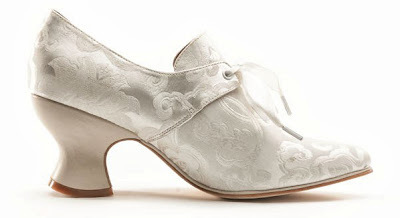 I am so tempted to buy a pair and wear them with my Elizabethan gowns even though I know it wouldn't be correct. They're just that pretty. I probably shouldn't admit this, but I wear my 18th c. shoes with my Elizabethan stuff all the time, lol. Very pretty! Are they still left and right or are these straight lasts? Hi Isabella - thanks! All of our shoes are and will always be left and right lasted. We go for comfort over crippling. It's the one area where I feel it is important to compromise for the sake of our customer's feet. We want you to be able to wear our shoes all day long without pain, and right out of the box without a "breaking in period." After I finish paying for the ones I am already buying, it's either going to be these or the Victorian boots.